BUENOS AIRES – Dec. 19, 2015 – The USPA is pleased to announce the first American-bred horse to be honored by the Argentine Polo Horse Breeders Association. 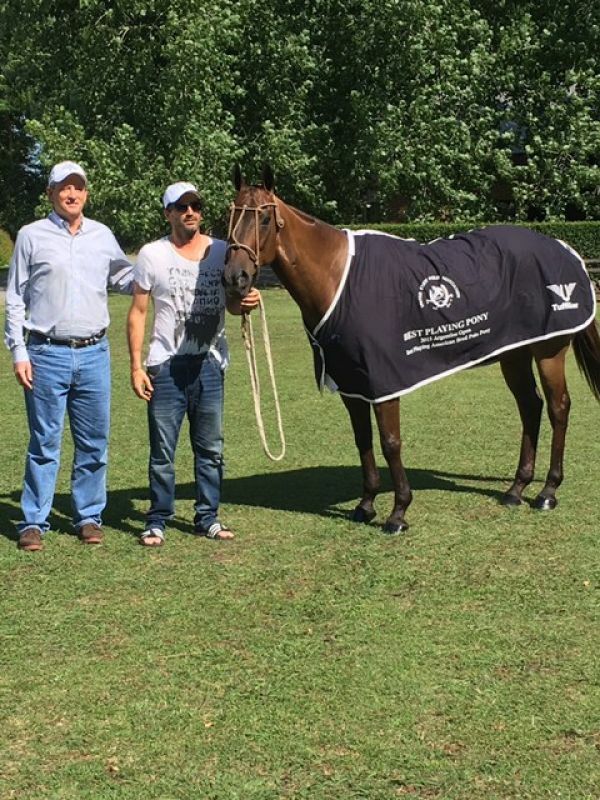 The Asociación Argentina de Criadores de Caballos de Polo honored Chocolate as the Best-Playing American-bred Polo Pony in the 122nd Campeonato Abierto Argentino de Polo (Argentine Open Polo Championship 2015) in Palermo. Bob Jornyvaz and Adolfo Cambiaso with Chocolate. Photo: United States Polo Association. Cambiaso competed Chocolate through the Argentine season on his way to winning a history-making third consecutive Triple Crown at Palermo on Dec. 12. 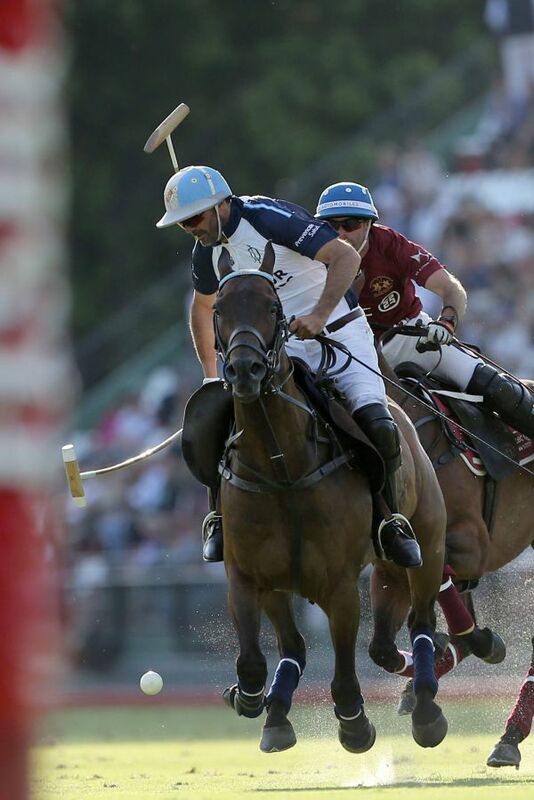 He played the horse in two pivotal chukkers of the 2015 Final, which La Dolfina won 13-12 over Ellerstina. Chocolate also won Best-Playing Pony at the 2015 Tortugas Open and was heralded as the top polo pony in the world after being awarded the Susan Townley Cup for Best-Playing Pony in the 2013 Argentine Open. Cambiaso has ridden a horse to that ward seven times. Adolfo Cambiaso on Chocolate, owned by Valiente Polo. Chocolate found his way to the Valiente string from breeder Ken Berry in California, who felt there was something special about the Thoroughbred gelding. He got in touch with Jornayvaz, who bought him as a younger horse. Chocolate is now 12 years old. Jornayvaz described Chocolate as “a great combo of talents who also has size,” adding that “Adolfo and Miguel (Novillo Astrada) love him.” Novillo Astrada has also competed Chocolate. Chocolate, who is not an off-the-track Thoroughbred, has a lineage that includes several polo-playing ancestors. The dark bay gelding (by Morningstar out of Empress) was born in June 2003 in the Santa Ynez Valley near Santa Barbara, California. Both his parents were Thoroughbreds. Joel Baker owned the sire; Berry owned the dam and the foal. As the steward of the Association’s marks, USPA Global Licensing’s mission is to develop a long-term source of revenue to help underwrite numerous programs for education about and promotion of the sport of polo in the U.S., from memberships and handicaps, to clubs and tournaments; from interscholastic programs to Team USPA mentoring; with particular concern for equine welfare and player safety throughout.